The first region we look at for climate data is the slice of the Arctic from 0° to 30° East, the northern part of Scandinavia. I haven't figured out how to superimpose the coverage map over the regular map, so I present these two illustrations separately. The blue dot at the top is the North Pole. We get no readings near it. 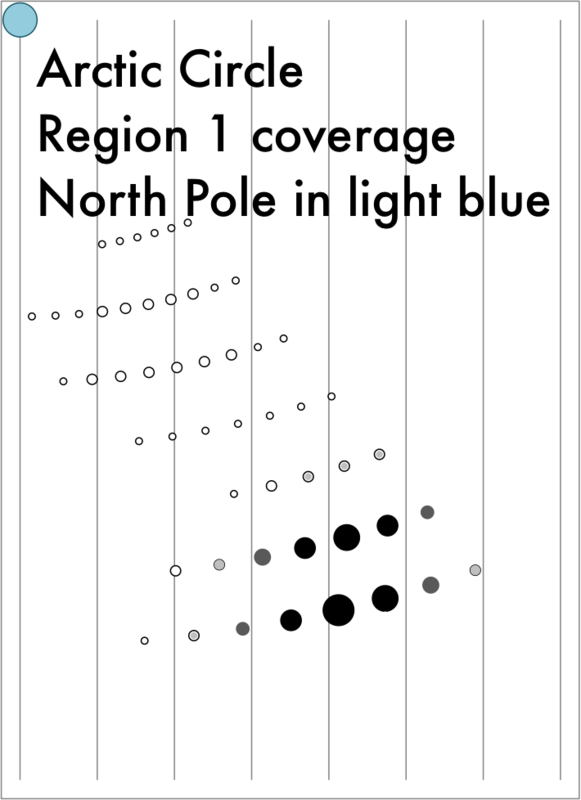 There are seven strips of dots in what should be a 10 × 10 grid, but almost all the weather stations that don't move are on dry land. 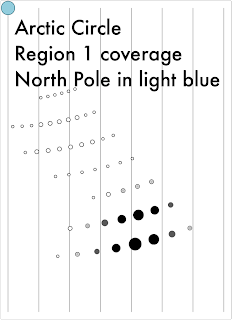 The larger and darker dots show grid areas with lots of readings, the smaller and lighter dots show less readings. We get no data north of Svalbard, the island that is the northernmost part of Norway. 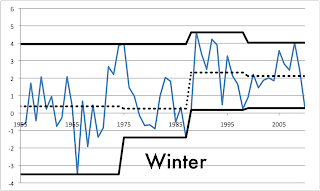 Here is the data for Winter from 1955 to 2010 in this region. The record for warmest temperature in the four time intervals barely moves at all. The median - the dotted line - shows a big jump after 1988, but little movement since. 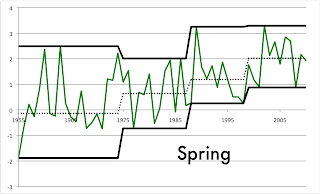 The lowest temperature shows a warming trend each interval, but the difference between the low in the 1990s is only slightly lower than this decades' low. 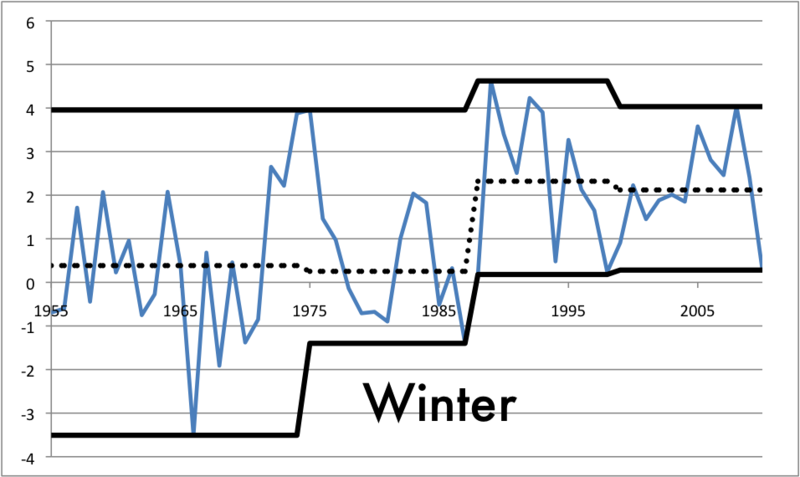 Strongest argument for warming trend: The low temperature data. 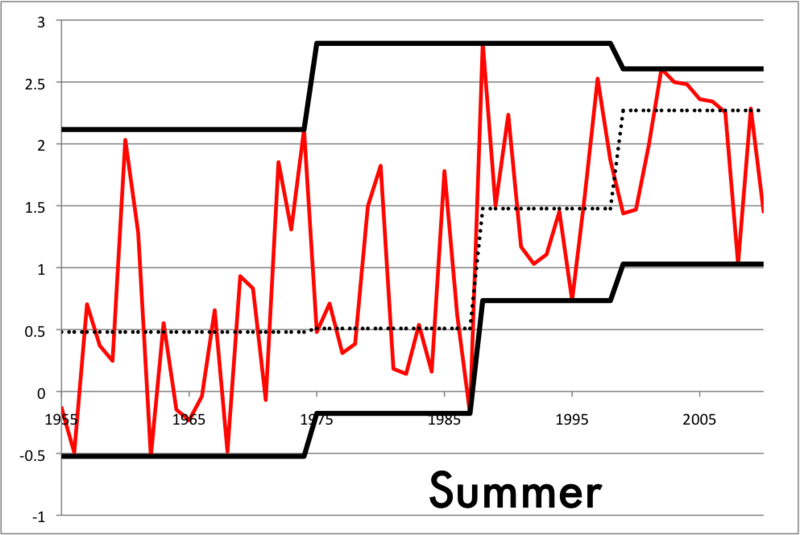 Strongest argument against warming trend: The small differences between 1988-1999 and 1999-2010. 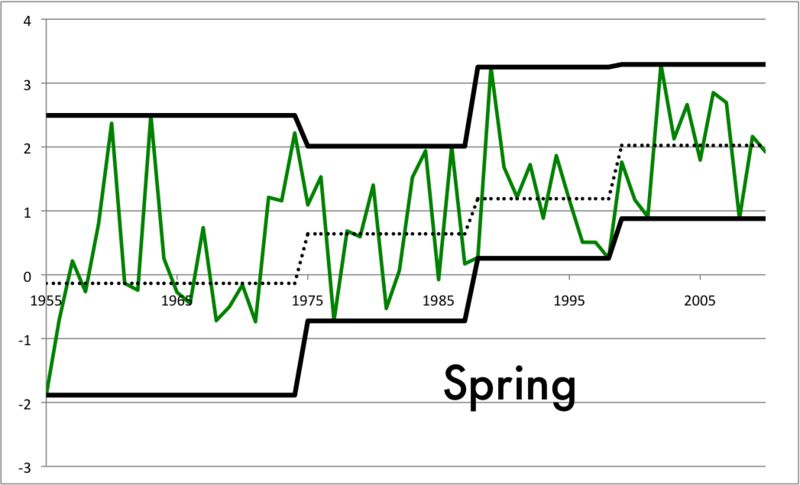 Here is the data for Spring. The low and median temperatures for our intervals definitely show warming, that left to right step pattern. The warmest temperature pattern steps up only slightly. Strongest argument against warming trend: The new record average temperature only barely beat the old. 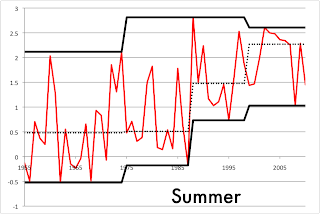 Here is the data for Summer. The low and median temperatures for our intervals definitely show warming, the median shows a lot of warmer than normal years in the most recent interval. Strongest argument for warming trend: The jump in the median temperature from 1988-1999 to 1999-2010. Strongest argument against warming trend: No new record average high temperature for twenty years. 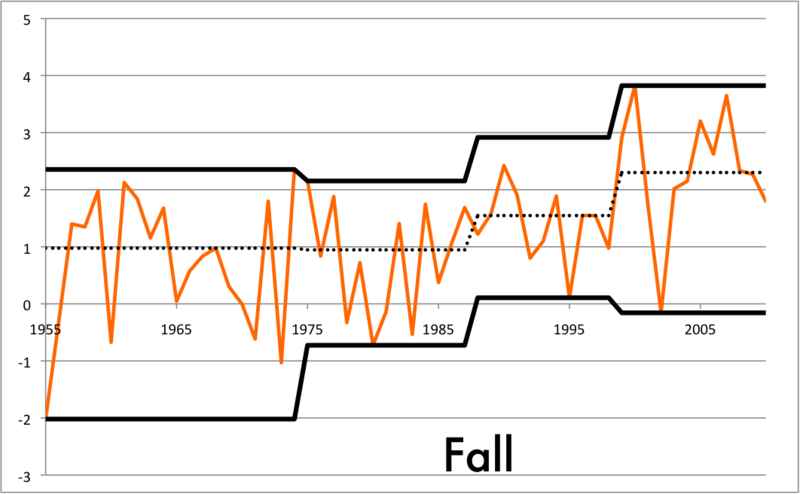 Here is the data for Fall. This is the only season where the high temperature in the most recent interval is noticeably warmer that the previous record. The median temperatures for our intervals also, but the low temperatures data is not convincing. Strongest argument for warming trend: The jump in the median and high temperature from 1988-1999 to 1999-2010. Strongest argument against warming trend: The low in this century is below the low in the 1990s. Most warmest readings: 1999-2010 with 8, 1988-1999 with 3½, 1975-1988 with ½. Most 2nd warmest readings: 1988-1999 with 8½, 1999-2010 with 3, 1975-1988 with ½. Most 3nd warmest readings: 1975-1988 with 6½, 1955-1975 with 4½. 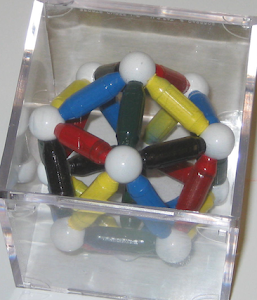 1999-2010 with 1. Most coldest readings: 1955-1975 with 7½, 1975-1988 with 4½. Is this region warming from interval to interval? The best arguments say yes. 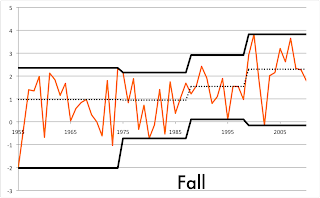 Is the rate of warming increasing? The median is the best of the three data trends to follow for this question, and only winter looks like it's slowing down. 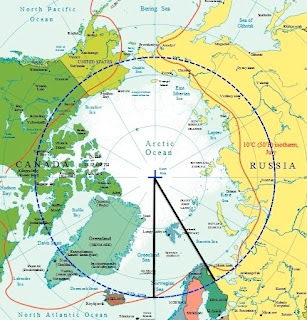 Later today, the northern Polar region from 30° to 60° East, the westernmost part of polar Russia.